PADI is giving back to the ocean in celebration of #GivingTuesday, December 3rd – an international day to celebrate giving. To mark the beginning of the holiday season PADI will match all donations to Project AWARE up to $10,000. And all donations of €125, £100 or more made by 1 January 2014 receive a Project AWARE ecoethical t-shirt to show off your support. PADI’s commitment to #GivingTuesday is an industry first and we encourage all dive centres and PADI divers to give back to the ocean and make #GivingTuesday a day for our ocean planet. How to Give Back on #GivingTuesday? Show your support of #GivingTuesday by taking a picture, tagging it #unselfie, #GivingTuesday and #projectaware, and sharing on Facebook, Twitter or Instagram until December 4! Thank you to all PADI Members and Dive Centres who support Project AWARE. Please look out for more alerts from Project AWARE on how you can get involved. Nearly one in five shark and ray species is threatened with extinction – the time to act is now. High demand for the international fin trade is the main driver for hammerhead fishing. In some areas hammerhead populations are down 80%. The search is on! Are you a local ocean hero with an innovative, results-driven project addressing marine debris solutions or focusing on protecting critical shark and ray species? If so, Project AWARE’s Ocean Action Project could be the support you need to take your project to the next level. We want to support strong grassroots projects that help build a wave for global ocean protection in two key focus areas: Sharks in Peril and Marine Debris. 1. Does your Ocean Action Project idea qualify? Check out the guidelines and application to find out. 2. Complete the simple application by 31st October and submit a photo to help tell your story and inspire the public vote. 3. Can it stand up to the rest? Project AWARE will select the best of the best and let the public cast the final vote in November. If your project is selected, you’ll receive funds to give your project the extra push to succeed. If there’s an action orientated project that inspires you, please spread the word and invite others to apply. Feel free to be in touch with questions and stay tuned to vote for your favorite Ocean Action Project! 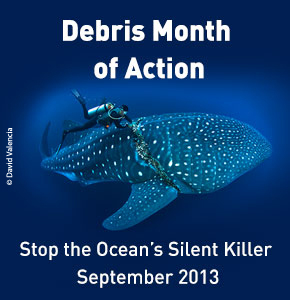 Every day, scuba divers around the world battle the ocean’s silent killer – marine debris – from beneath the surface. Their mission during this September’s Debris Month of Action? To inspire year-round action to remove, report and prevent underwater debris while combating the growing marine debris problem. More than six million tons of marine litter is estimated to enter the ocean each year. Once there, our trash accumulates and includes everything from plastic bags, food wrappers and drink bottles to car batteries, fishing nets and industrial waste. Want to get involved but not sure how to get started? Check out the Dive Against Debris Event Organizer Kit – Download helpful tools to recruit, organize and recognize your volunteers as well as ideas for how to organize additional activities alongside your survey such as a family fun day, BBQ lunch or fundraiser. If you’ve supported Project AWARE’s campaign, signed their shark petition or rallied shark support in your community – then this message is for you. Today, we need your help. Please take a few moments and send a letter direct to CITES leaders asking them to vote “Yes” for sharks and rays this March. What we do in the next few weeks could make a difference for 11 sharks and rays on the brink. Project AWARE is working with their partners, pounding the pavement harder than ever in the run up to March. We’re meeting with CITES leaders face-to-face to help influence the votes. More than 120,000 shark petition signatures you helped to collect are making a strong argument for change. Now you can send a letter direct to CITES leaders, insisting on international protections for these critical species.